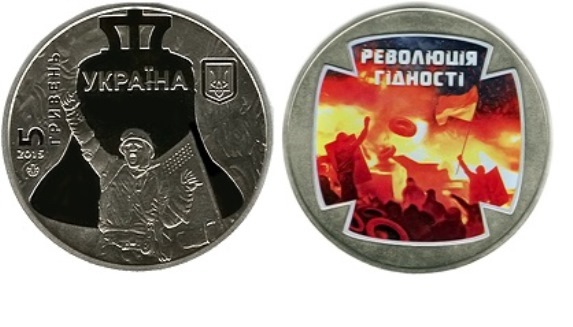 The National Bank of Ukraine announced the launch of commemorative coins, the Heroes of Maidan series, 2015, dedicated to last year’s protests on Maidan [Independence Square] that led to the change of power in Kyiv. This was reported on the Bank’s website. The series is dedicated to the protests that took place in Ukraine from November 2013 – February 2014, which were filled with the desire to change to a European direction for the country. According to the website of the National Bank, from February 18th, all 3 coins will be launched dedicated to the events on Maidan. They will be called The Revolution of Dignity, Euromaidan and Heaven’s Hundred. All are with a nominal value of 5 hryvnia and will be released in an edition of 50 thousand copies each. The artists who composed the coins are Vladimir Taran, Alexander Kharuk, and Sergei Kharuk. The sculptors are Svyatoslav Ivanenko and Roman Tchaikovsky. Dedicated to civic courage and patriotism, which were exhibited by the citizens of Ukraine of all nationalities, in seeking to develop and strengthen the democratic state constitutional principles of democracy, human rights and freedoms. On the obverse side of the coin, against the background relief pattern of a flame, a dark black shape of a large bell looms with the inscription UKRAINE inside it at the top, under which is the figure of a participant in the events, a member of the self-defense units or sotnia. On the reverse side of the composition, inside the contours of the cross, one of the fragments of the event – the confrontation on Maidan during which people burned tires – is depicted in full color. (The flags are depicted using tampography or tampoprint pad printing to get the color). On the obverse side of the coin against a background in relief of a stylized flag is depicted a fragment from a rally (“viche”): a central square formed by a crowd of people framed by the inscription, which is a quote from Article 5 of the Constitution of Ukraine: “the bearer of sovereignty / the only source / of POWER IN UKRAINE / are the people. On the reverse side: against the background of the flag of the European Union (in color) is a hand clenched into a fist, holding the State Flag of Ukraine (in color, using tampoprint). Along the left is the inscription Euromaidan. Dedicated to the memory of the heroes who became a symbol of dignity, each of whom made a personal act of courage, and took a stand against violence and injustice, giving back the most precious of all – their lives, for a new, revived Ukraine. The composition on the reverse of the coin: on the bottom are candles with flames that rise up into the sky symbolizing the souls of the heroes against the blue-yellow (tampoprint used) of the National Flag of Ukraine. At the top, against a black background, is a stylized inscription: “Heavenly / Hundred” with the “t” of the Ukrainian “sotnia” (for hundred) stylized into an orthodox cross. This entry was posted in English, English News, Maidan Diary, Pictures and tagged commemorative coins of Maidan, EuroMaidan, Heaven's Hundred, Heroes of Maidan, Revolution of Dignity, Ukraine, Ukrainian mint. Bookmark the permalink. How may I go about purchasing 6 of each of the three coins commemorating coins listed? Altogether it would be 18 coins.